MUNICH--(BUSINESS WIRE)--Nov. 13, 2018-- Cypress Semiconductor Corp. (NASDAQ:CY), the embedded solutions leader, today announced it is expanding its Internet of Things (IoT) solutions portfolio with a new member of its ultra-low-power PSoC® 6 microcontroller (MCU) family. The new PSoC 6 MCU is purpose-built to address the growing needs for computing, connectivity and storage in IoT edge devices. The new MCUs include expanded embedded memory with 2MB Flash and 1MB SRAM to support compute-intensive algorithms, connectivity stacks and data logging. Additionally, Cypress announced two new development kits for the PSoC 6 family, enabling developers to immediately leverage the industry’s lowest power, most flexible dual-core MCU with hardware-based security—to prolong battery life, deliver efficient processing and sensing, and protect sensitive user data. PSoC 6 is empowering millions of IoT products today, providing the most secure and low-power processing available. More information on the PSoC 6 family is available at www.cypress.com/psoc6. Developers can evaluate the new PSoC 6 MCUs with expanded embedded memory using Cypress’ new PSoC 6 Wi-Fi BT Prototyping Kit (CY8CPROTO-062-4343W). This $30 kit features peripheral modules including Cypress’ industry-leading CapSense® capacitive-sensing technology, PDM-PCM microphones, and memory expansion modules, enabling quick evaluation and easy development. The kit is supported by Cypress’ ModusToolbox™ software suite that provides easy-to-use tools for application development in a familiar MCU integrated development environment (IDE). More information on the kit is available at www.cypress.com/cy8cproto-062-4343W. 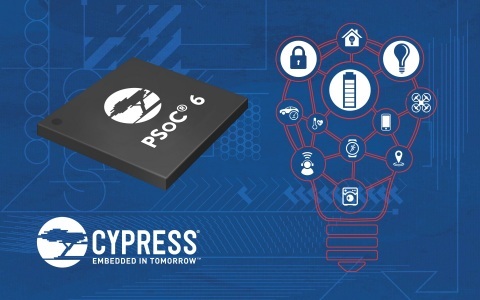 To streamline development of products with Bluetooth™ Low Energy (BLE) 5.0 connectivity, Cypress has introduced the PSoC 6 BLE Prototyping Kit (CY8CPROTO-063-BLE). This $20 kit features a fully-certified CYBLE-416045-02 BLE module—a turnkey solution that includes a PSoC 63 MCU, onboard crystal oscillators, trace antenna and passive components. More information on the kit is available at www.cypress.com/cy8cproto-063-ble. Cypress is demonstrating its PSoC 6 family of MCUs, along with its complete embedded systems solution portfolio, here at the Electronica 2018 trade show in hall C5 stand 446 of the Messe München from November 13-16. The PSoC 6 architecture is built on an ultra-low-power 40-nm process technology, and the MCUs feature low-power design techniques to extend battery life up to a full week for wearables. The dual-core Arm® Cortex®-M4 and Cortex-M0+ architecture lets designers optimize for power and performance simultaneously. Using its dual cores combined with configurable memory and peripheral protection units, the PSoC 6 MCU delivers the highest level of protection defined by the Platform Security Architecture (PSA) from Arm. Designers can use the MCU’s software-defined peripherals to create custom analog front-ends (AFEs) or digital interfaces for innovative system components such as electronic-ink displays. The PSoC 6 MCU features the latest generation of Cypress’ industry-leading CapSense capacitive-sensing technology, enabling modern touch and gesture-based interfaces that are robust and reliable. Cypress’ PSoC 6 MCUs are production qualified today and are in-stock at authorized distributors. The new PSoC 6 MCUs with expanded embedded memory are currently sampling and are expected to be in production in the first quarter of 2019. The PSoC 6 Wi-Fi BT Prototyping Kit (CY8CPROTO-062-4343W) is available for $30 and the PSoC 6 BLE Prototyping Kit (CY8CPROTO-063-BLE) is available for $20 through the Cypress online store, and both will be available from authorized distribution partners in November of 2018.